Beautifully engraved certificate from the Union Wire Rope Corporation issued in 1928. This historic document was has an ornate border around it with a vignette of the company's logo. This item is hand signed by the Company's President ( R.H. Bartlitt ) and Secretary and is over 76 years old. 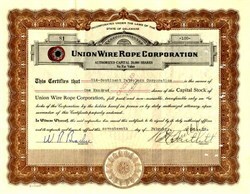 Union Wire Rope was acquired the Wire Rope Corporation of America in 1988. Wire Rope Corporation of America, was incorporated in Connecticut in 1931. The company relocated to St. Joseph, Missouri in 1948. Wire Rope Corporation of America is the largest producer of wire rope in North America. They have rope mills in St. Joseph, Sedalia, and Kansas City, Missouri, wire mills in St. Joseph, Kansas City, Sedalia, and Chillicothe, Missouri, four regional fabricated products facilities, 13 corporate service centers and six synthetic web products manufacturing facilities. Products are marketed worldwide through over 1500 Wireco., Leschen and Union Wire Rope distributors.